A beautiful island called Pulau Beras Basah is currently popular among tourists. Not only offers beautiful white sand beaches, the presence of a lighthouse that stands firmly become the island's icon. Perhaps many people are curious about this Beras Basah Island. Its name is unique called Wet Rice Island, unlike most other islands which depicts the beauty of an island. Nevertheless, Beras Basah Island store the beauty for anyone spoil the eye of the beholder. Beras Basah Island is a small island in the Makassar Strait. Administratively, the island is under government of Bontang, East Kalimantan. For those who want to enjoy the beauty of Beras Basah Island, there are several alternative paths to get on this beautiful island. From Balikpapan, a traveler can proceed to Bontang takes about five hours using a private vehicle. For those who do not bring their own vehicle, do not worry. You can still get Bontang using public transport. Use the bus and you have to pay of 85,000 IDR a traveler has been able to arrive at Bontang. However, if you start the trip from Samarinda, Bontang it took over a minute, less than two hours and only have to pay 20,000 IDR per passenger if utilizing a public bus. Arriving in Bontang you still have to continue the journey across the ocean to arrive at BerasBasah Island. There are many rental ships with price varies, ranging from 300,000 to 400,000 IDR which can accommodate up to ten passengers at a time. You will be satisfied during a visit Beras Basah Island. The beauty of its beaches deserves a mainstay of Bontang, with grain white sand to the crystal clear sea water always makes tourists linger dwell Beras Basah Island. Not only beauty of the underwater scenery, Beras Basah Island also be a fitting place to enjoy the sunset. The redness that wrapped a bright blue sky and wind gusts made the beach watching the sunset moment so romantic. 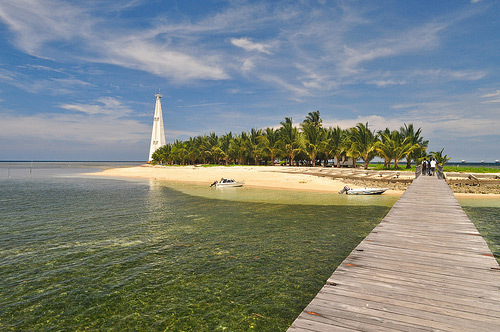 Beside the stunning scenery, Beras Basah Island also identic with a lighthouse that stands firmly in it. Lighthouse built by PT. Badak become its own attraction for tourists.